DD Form 2365 or the "Dod Expeditionary Civilian Agreement: Emergency-essential Positions And Non-combat Essential Positions" is a Department of Defense-issued form used by and within the United States Army. The form - often mistakenly referred to as the DA form 2365 - was last revised on August 1, 2017. Download an up-to-date fillable PDF version of the DD 2365 down below or find it on the Department of Defense documentation website. Civilian employees are asked to perform operational mission functions in locations and positions away from their normal workplace. associated with the Systems of Record indicated above. of the individual from Federal Service. a. To perform duties and responsibilities as an E-E employee and/or NCE employee consistent with DTM-17-004. are designated as Key Positions as defined below. stability operations of the DoD. the parent Federal Agency or office to function effectively, in accordance with DoD Directive 1200.7. (1) As a condition of employment, executing this agreement is required when applying for a position designated as E-E and/or NCE. be deployed worldwide to perform functions critical to accomplishing operational missions. Ready Reserve. I must notify my servicing military personnel center of my acceptance of this E-E or NCE position. skills, abilities, and medical and psychological fitness to be successful in high pressure and austere operational environments. ethical behavior to maintain a deployment environment characterized by good order, discipline and conduct. required of a deploying military member. 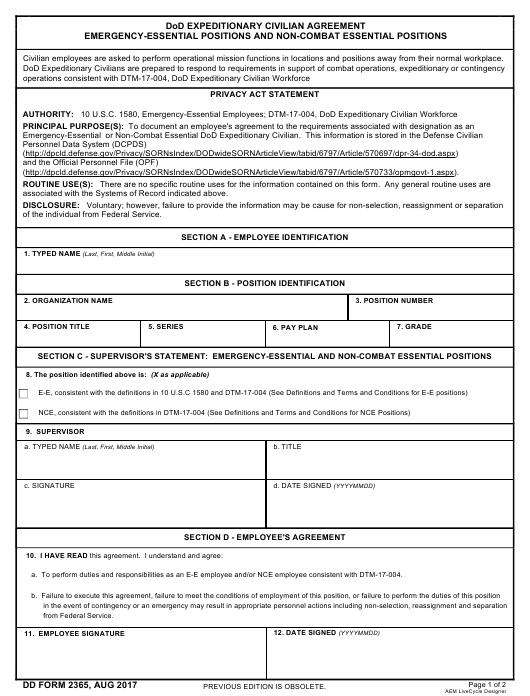 1342.19 and a Record of Emergency Data (DD Form 93). Surveillance System may also be required in accordance with DoDI 6490.03 or other deployment health policy. (2) While deployed, I will serve under the Combatant Commander's authority, direction, and control of the area in which I serve.